You can prepare three months’ worth of delicious, nutritious, homemade baby food in just three one-hour blocks of time! Perfect for busy parents, Dr. Lisa Barrangou’s unique plan features instructions for preparing, freezing, thawing, and effortlessly combining puree “building blocks” into quick, tasty meals. 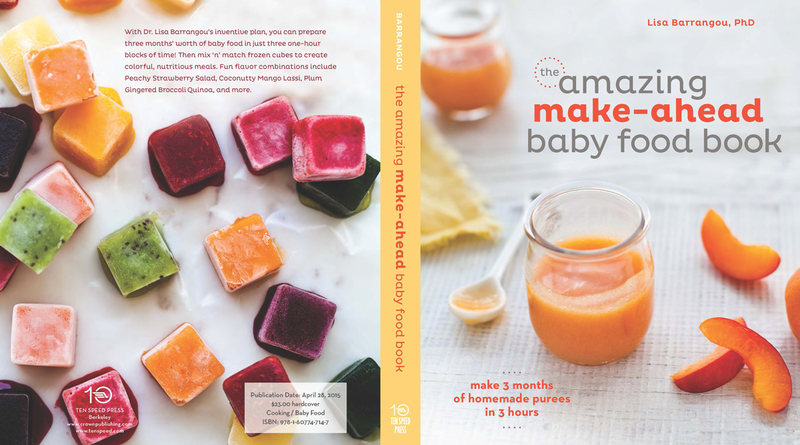 With fun combinations like Peachy Strawberry Salad, Coconutty Mango Lassi, Plum Gingered Broccoli Quinoa, and Purple Papaya Flax Yogurt, The Amazing Make-Ahead Baby Food Book will help your baby cultivate an adventurous palate while providing a rainbow of nutrients. Written by a former corporate food scientist, turned healthy living advocate and baby food chef, The Amazing Make-Ahead Baby Food Book provides all the information you need to efficiently and confidently feed your baby only the best that nature provides, in an amazingly efficient amount of time. The book does all of the planning for you, guiding you through simple nutrition principles and meal planning techniques that will prepare you for feeding your baby healthy foods for a lifetime. Available as a hardcover book or e-book wherever books are sold. Over 100 recipes for single ingredient purees, combination purees, complex meals, and gluten-free cereals.